SharePoint and InfoPath Bring Collaboration - BizTech Solutions, Inc. The Department of Social Services (DSS) for one of the most populous states in the U.S. endeavors to carry out its mission of providing aid, services and protection to needy children and adults. At the same time, the DSS strives to strengthen and encourage individual responsibility and independence for families. By managing and funding its programs, the objectives of the DSS are carried out through the 4,200 employees located in 51 offices throughout the state; the 58 county welfare departments, offices and a host of community-based organizations. Imagine how difficult it would be to try to develop time-sensitive content for official state fiscal letters and informational notices when the people you have to collaborate with—and get approval from—are miles away and extremely busy. Coordinating Contact/Schedules for a meeting is all but impossible. Tracking progress of those documents is even more difficult. Budget documents, procedural manuscripts, reporting instructions—all of these took the Department of Social Services an average of 6-8 months to complete manually. Staff within an agency would need to solicit input for all-county letters, information notices, and county fiscal letters. The content solicitation process alone took months; the approval process up through the various levels of the organization was handled manually by couriers. Any changes made along the way required going back to square one and restarting the approval chain, adding even more delays. BizTech was awarded the application development contract to help the DSS create a secure collaborative solution, reducing their turnaround time to a fraction of what it was. The solution is a perfect marriage of the efficiency and simplicity of Microsoft InfoPath Forms, and the security and flexibility of Microsoft Office SharePoint Server. With system integration by BizTech—a Microsoft Partner—these technologies enabled the DSS to improve organizational effectiveness by providing workgroup collaboration, comprehensive content management, and workflow capabilities to facilitate information-sharing across organizational boundaries. To initiate the process of collaboration on a letter or notice, a Creator Analyst uses their web browser to navigate to the site hosting the “Start Form” link. They complete the customized InfoPath form, noting those included departments and staff members who provide input or review only. The Creator Analyst attaches the new letter to the form and then simply clicks the Submit button. A new, secured letter-specific SharePoint site is created automatically from a template, based on the type of letter indicated on the InfoPath form. The site templates exist on a SharePoint Server and are preconfigured with Document Library, Web Parts, Workflow Templates and Workflow Lists. The Site Creation Service adds users with appropriate permissions to the new site, uploads the document attached to the InfoPath form and starts the workflow. The system creates sub-sites on demand from the InfoPath forms, giving each individual group a team site for more specific collaboration on the individual letter. Users identified as contributors or reviewers are notified of impending tasks via email. The workflow task message contains a link to the task form with parameters specific to the workflow and task. As the contributors and reviewers perform their work and submit the task form when complete, the system updates the database and tracks the progress of the effort. If a letter or notice requires re-work, the workflow automatically routes it back to the appropriate contributors and reviewers for final approval. The system keeps track of all upcoming and due tasks to provide alerts and notifications as appropriate to assist in the responses of the assigned reviewers/approvers. 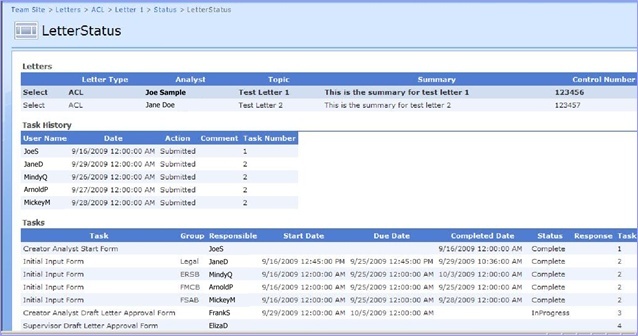 Dashboards are also provided to allow management staff to quickly see the status on any letter, as well as providing metrics for turnaround times on all letters. With this capability, they can be more proactive for improving and changing processes to meet quicker and timely delivery of the letters.